Watch again The Community Voice with Paul Toal and Andrea Faulkner. I am requesting help on Twitter, and social media in general, to get the message across to Assembly Members across Wales that there is still time to reverse the awful decision to close WILG and transfer all responsibilities for Independent Living to local authorities. 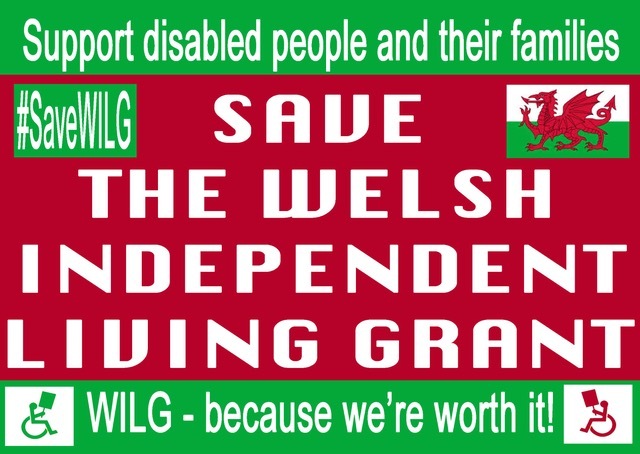 This is a crucial time for the #SaveWILG campaign as we are hoping to convince Assembly Members that they need to take action and protect people with high care and support needs across Wales by saving the Welsh Independent Living Grant. Other key people to contact are members of the Petitions Committee who are continuing to consider our petition – David Rowlands (@DavidRowlandsAM ‏), Janet Finch Saunders (@JFinchSaunders), Mike Hedges (@MikeHedgesAM), Rhun Ap Iorwerth (@RhunapIorwerth) and Neil McEvoy (@neiljmcevoy). Any pressure we can put on politicians has to be a good thing as they need to realise the devastation that the decision to close WILG will have on disabled people and their families. The outgoing Carwyn Jones (@fmwales) and Huw Irancca Davies (@huw4ogmore) are also worth a tweet to remind them that this campaign is still going strong. Obviously the following hashtags should be used only when the associated TV programme is being aired, or on the relevant day of the week. For example, #bbcqt should only be used while ‘Question Time’ is being aired. Likewise, the popular hashtag #FridayFeeling should only be used on a Friday. A general list of AM Twitter handles can be found below along with a suggested Tweet and electronic postcards and memes that can be attached to Tweets for greater impact. Even if you only manage to Tweet a handful of AMs, this could make a real difference to disabled people across Wales. These Tweets should be accompanied by some of the many postcard photographs, electronic postcards and memes. I have updated this list of Twitter handles which was a little dated. Please remember that messages can also be sent via Facebook with accompanying memes.